Canadian firm Sunrise Records has emerged as the buyer of collapsed music chain HMV, beating competition including Sports Direct owner Mike Ashley.The firm will buy 100 stores out of administration, securing 1,487 jobs.But 27 stores will close, resulting in 455 redundancies.Sunrise Records chief executive Doug Putman said he was "delighted to acquire the most iconic music and entertainment business in the UK." Administrators KPMG, who ran the business until a buyer could be found, say they will tell staff this morning if their store is closing before saying which stores will be lost. Canadian entrepreneur Mr Putman bought the retail chain Sunrise Records in 2014. He previously bought HMV's Canadian business in 2017, expanding his small chain into a national operation with 80 outlets. Mr Putman also owns Everest Toys, the largest toys and games distribution company in North America.He told BBC Radio 4's Today programme that HMV was a "fantastic, heritage brand".He also said the chain would be looking to stock more vinyl records, in response to customer demand. 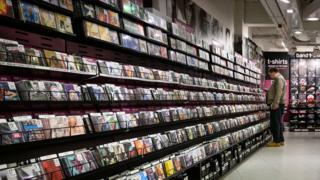 "I feel really lucky to be able to say we [will] continue to call it HMV," he told the programme. There had been speculation that the shops might be rebranded as Sunrise Records stores after Mr Putman's rebranding of HMV's Canadian business. "It is very clear that the customer wants more selection on vinyl, more depth of catalogue," he said. "There's in no doubt that online is a big part of overall retail sales. But people like to come into a store, have an experience, talk with someone who understands music, loves music, loves video and entertainment. If you think online is the only future I don't think that is the case. "He added: "There is so much you get from come into a store that you can't get online. "HMV collapsed in December, its second administration in six years. Until now, Mr Ashley had been the likely favourite to take over the music retailer.As the owner of more than 60% of Sports Direct, he has bought retailers including the House of Fraser department store chain and Evans Cycles.His company also owns stakes in French Connection and Debenhams. ShrinkageThese include business rate levels and the increasing use of streaming services to deliver music and movies.HMV sold 31% of all physical music in the UK in 2018 and 23% of all DVDs, with its market share growing month by month throughout the year.However, the music industry expects physical entertainment sales to shrink by another 17% this year.Will Wright, partner at KPMG and joint administrator said: "We are pleased to confirm this sale which, after a complex process, secures the continued trading of the majority of the business. "Our immediate concern is now to support those employees that have unfortunately been made redundant."